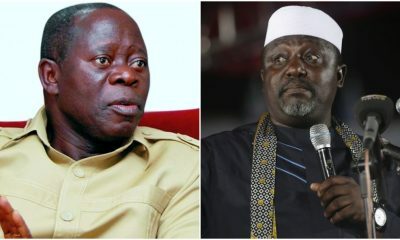 Imo State Governor, Rochas Okorocha has warned that the National Chairman of All Progressives Congress (APC), Adams Oshiomhole, is fast turning the party to regional minority party. Okorocha spoke with State House correspondents after meeting with President Buhari at the Presidential Villa, Abuja. He said APC might have serious setback because of Oshiomhole. Asked to speak on the mistake of 2015 and new leadership for the National Assembly, Okorocha said “I have been watching carefully what is happening in the National Assembly, it’s a very interesting drama. But all I ask them is that they should consider the South East in their calculations. “This nation will not be properly balanced if South East is not carried along properly in the affairs of the National Assembly. Nobody seems to be talking about the South East, it looks like the South East doesn’t have a place anymore, that is wrong, politically speaking and that is not good for APC. “Because there is going to be a bigger APC after President Buhari must have left the seat. My fear now is that APC might have a serious setback in 2023 because the Oshiomhole’s led executive is actually turning APC into a regional minority party which shouldn’t be because of his mistakes. “Right now in the whole South East, we don’t have an APC governor. So if there is any discussion in Nigeria now within the APC governors and President Muhammadu Buhari, there would be nobody from the South East. “This is what the APC Chairman has done in the South East. I think it’s a capital attempt to frustrate the efforts of the South East. But I appeal to every Nigerian to support the cause of the South East. He also pointed out that Oshiomhole was behind his predicament. According to him, INEC has no right to withhold his certificate of return. Asked why his party is not making any case for his certificate of return, he said “I won’t be surprise because, of course, you know the imposition we suffered in the party. When you say the party, you talk about the leadership of that party. I don’t have problem with the Working Committee of that party, I only have problem with the chairman of that party as he took it upon himself to do the wrong thing against me for just no cause and to fight a battle that he can never win. “No, he is the one that is behind all these impositions, can you imagine, as I speak to you the APC candidate in Imo State did not win a seat, APC does not have a councilor in Imo State now, it does not even have a House Member. “But the AA party has eight seats in the Imo State House of Assembly, two Federal House and they have one senator about to come to the Senate. This is why internal democracy must be respected, let the will of the people prevail rather than this imposition. On the true position regarding his certificate of return, he said “As it stands today, I am just waiting patiently for the release of my certificate of return for election that I duly won, and I am hoping that INEC will release my certificate of return. 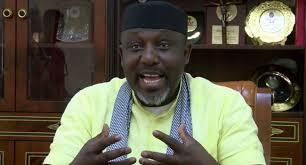 Asked if he discussed the issue with the President, Okorocha said “I don’t think that would have been necessary to do because, it’s a straight forward matter. INEC conducted election, results were declared – the returning officer declared the results and I won. Only, one week later to hear that somebody wrote a petition that he issued that declaration under duress. I say where? Was it in his private house or was it in the collation Centre? “The man has not been able to say that. Nobody has ever sent a statement about that. But I think INEC would want to do the right thing very soon. “Now in the same way, the governorship candidate of PDP never won that election because the election flouted section 179 of the constitution of the Federal Republic of Nigeria which says that you must have the highest votes and you must have 25 percent in two third of the local governments. “Now, this gentleman who was declared the winner by the same INEC, had 135,000 votes from 24 local government but had over 130,000 votes from his three local governments. Of course you know, he didn’t win that election. But even at that, we had the highest mark, the Returning Officer of INEC was never patient to even calculate to know that it was 200,000 votes cancelled and there is supposed to be a rerun. “Also flouting that basic constitution of the federal republic of Nigeria which says you must have 25 percent in two-third, he doesn’t have it.